On moving inland from Scarborough (N. Yorks) I sold my share in a Hydro 28 that we regularly raced round the buoys. It was strange to be without a boat again. I’ve been messing about in boats for almost 70 years and I soon realised I had to have another. This time it had to be one that I could (where necessary) sail single handed in waters that I had not yet explored but could also be used for family outings with grandchildren. I had taught my children to sail in a Mirror and later a Wayfarer but I don’t bend and move as easily as I did so I wanted something more stable and appropriate for a grandparent. I had read, and been very impressed by, reviews of a succession of Swallow Boats but when the BR20 Expedition was featured I thought that all my ideals in a new boat seemed to have been met and so I resolved to make a visit to Matt Newland’s yard to see his latest development for myself. I loved the quality of what I saw and it was clear that the many lovely details in the design substantiate the Swallow slogan “Classic looks – Modern performance”. Not only that, the boat is set up to be really easily handled in every respect from the carbon fibre spars that are easily raised and lowered single handed, the fully battened main with its lazy jacks and easy slab reefing to the outboard being all ready in situ but clear of the water when sailing. I had not heard of “Raiding” until Matt explained it as part of the rationale for the design but the option to row the boat properly in windless conditions is another great facility. For keen raiders who use oars to row/sail in races it is vital! Once Nick Peters became established as a dealer it became feasible to go down from Yorkshire for a trial sail without tackling the West Wales road network which is beautiful but slow! I was still very open minded as we set off from Northney Marina and we had arranged for a friend to bring his Wayfarer for comparison purposes and to see the two boats side by side. To my surprise, in a moderate headwind the Wayfarer couldn’t keep up with the Expedition as we tacked down towards East Head until we had pulled down a reef and filled the water ballast. Neither action was really demanded by the conditions with three of us comfortably sailing her and keeping totally dry in the shelter of the spray hood. Admittedly, the Wayfarer was rather short of crew weight but I could no longer feel open minded. I had loved cruising in my Wayfarer and the realisation that I could return to that kind of sailing but in much more comfort and stability certain in the knowledge that there was a dry cabin to retire into at the end of the day blew away the argument that a brand new and fully equipped Wayfarer would be significantly cheaper. They’re like chalk and cheese! The ease of launch and recovery direct to the road trailer was also very impressive. I ordered my new boat the very next week. She was christened on Ullswater in blustery conditions the following spring. What a delight it was to find how amenable her yawl rig is. You either jog along under mizzen and jib or just heave to while you set, reef or lower the main. It’s amazing how easy it is to get just a light touch of weather helm. The fully battened main goes up and down its track really easily and the lazy jacks keep control of the bunt of the sail. 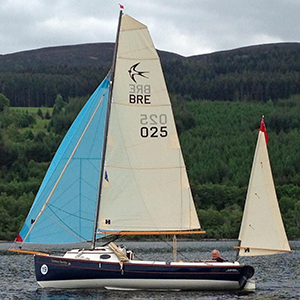 The next challenge was the Caledonian Raid from Fort William to Inverness (www.sailcaledonia.org). We didn’t win any of the races but we never expected to and anyway I was far too reluctant to get the oars out. Neither my son nor I could believe how easily and quickly we beat up the full length of Loch Ness against a freshening breeze and with no water ballast needed. What a fabulous boat she is proving to be. Since then, and to prove the point to myself I took her back to Ullswater Yacht Club where I rigged, launched, sailed and recovered her onto the trailer totally unaided. The only thing I didn’t attempt single handed was to set the asymmetric spinnaker but I will when the conditions are right. This septuagenarian is as happy as a dog with two tails having a boat that cries out for “expedition and adventure” that comes from a really approachable and supportive company.